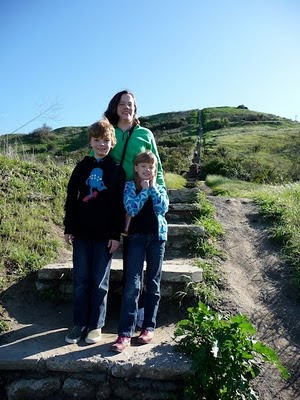 On Super Bowl Sunday back in 2010 I took my family over to the Baldwin Hills Scenic Overlook here in Los Angeles. The Baldwin Hills are a distinctive outcropping of hills several hundred feet high south of the 10 (Santa Monica) Freeway, and east of the 405 (San Diego) Freeway. 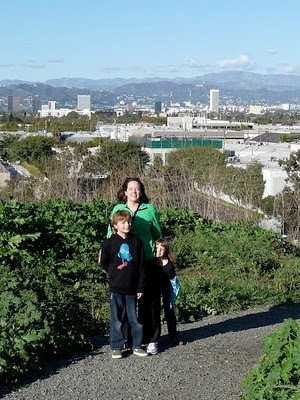 The Scenic Overlook is a newly opened 50 acre park located in the heart of urban Los Angeles and is part of of the California State Park system. The entrance is located on West Jefferson Blvd. There are trails leading to the top, but we opted for the stairs that go straight up the side of the hill. The stairs are fairly steep and are a good little work out. Here's a link to some on-line reviews from yelp.com. Almost to the top - we could see people at the overlook. As it was Super Bowl Sunday, I was surprised how many people were out and about doing other want things. This group is enjoying the view, with downtown Los Angeles in the background. If you to enjoy the view without the hike, you can drive to the top (parking = $6). It had rained the day before, so I was really hoping that there would be snow on the San Gabriel Mountains behind the Hollywood Hills. For whatever reason, that was not the case. Still, a pretty amazing view, including the Hollywood Sign. The Scenic Overlook is one of the best - perhaps THE best - view in Los Angeles. Unlike the overlooks at the Griffith Observatory or the Getty Center, the Baldwin Hills Overlook faces north, with sweeping views of downtown, Hollywood, Beverly Hills, Westwood, Santa Monica and the Pacific Ocean. All framed by the Santa Monica and San Gabriel Mountains. My daughter trying out the camera she got for Christmas. Looking out over Los Angeles with my family, I'm reminded of the question posed in Jonah 4:11 - "should I not be concerned about that great city?" I appreciate and am deeply challenged by what New York City based pastor and New York Times bestselling author Tim Keller has shared on this passage. Here's a link - I found it worth listening to. My son taking a photo of the city, with downtown L.A. in the background. Baldwin Hills is also the name of a television show on BET (Black Entertainment Network). Baldwin Hills has been referred to as "Black Beverly Hills" due to the large concentration of African American professionals and celebrities who've lived in the community. Heading back down towards our car. Mediterranean climate is only found in four other places on earth: the Mediterranean basin (hence, the name), western and south Australia, southwestern South Africa, and part of central Chile. Mediterranean climate means mild winters and warm, dry summer. No complaints here: it's pretty ideal. In terms of topography, metro Los Angeles has six major mountain ranges: the Santa Susannas, the San Garbriels, the San Bernardinos, the Santa Anas, the Palos Verdes, and the Santa Monica Mountains. 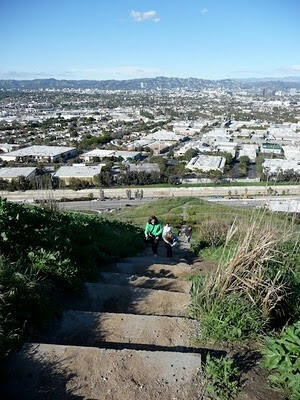 In addition, there are numerous smaller features like Baldwin Hills. FYI, the "Hollywood Hills" are really just part of the Santa Monica Mountains. The kids had a "good attitude" marching up and down the stairs, so we stopped off in Culver City at a 7/11 for a little treat. Some things (a trip to 7/11) are definitely not unique to Los Angeles. Here's a link to the Baldwin Hills Scenic Overlook website with more information.